Save a couple of forgettable tunes, it remains accessible yet modern, retaining a largely aggressive tone throughout. Bromsgrove's Daniel Trigger has been on the fringe of greatness and recognition ever since he burst onto the scene, releasing material under the moniker Trigger before pursuing a solo career and releasing songs regularly, including 'Army Of One' – his last album – that came out in 2014. 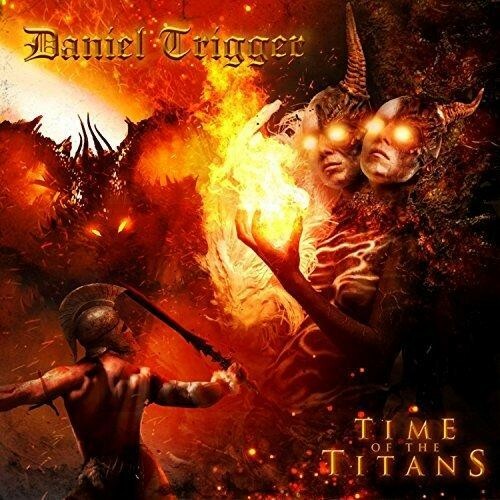 'Time Of The Titans' is Trigger's most complete work to date and is an accomplished blend of old-school Rock/AOR meets Modern tendencies. There's no lack of melody and the aggressive guitar riffs come thick and fast, like on opener 'Promised Land', 'Losing My Faith' and the thudding 'Here Comes The Rage'; the latter is an undoubted highlight of the album with its keyboard-infused nod to the eighties. The guitar playing throughout is outstanding, check out the classic groove on 'Welcome To The Real World' or the nifty solos that pepper the album throughout. Eighties Melodic Rock followers are also well catered for with the Aldo Nova/Bon Jovi sounding 'Do You Know Who I Am?' and the commercial Dokken-esque 'Pendulum' where harmony vocals and a chorus line are King. 'Time Of The Titans' maybe a little overlong at twelve tracks (thirteen if you include the bonus), but save a couple of forgettable tunes, it remains accessible yet modern, retaining a largely aggressive tone throughout courtesy of some crunching guitar and Daniel Trigger's soaring vocals.